On any list of the world’s most spectacular islands, Kauai ranks right up there with Bora Bora, Huahine, and Rarotonga. All the elements are here: moody rain forests, majestic cliffs, jagged peaks, emerald valleys, palm trees swaying in the breeze, daily rainbows, and some of the most spectacular golden beaches you’ll find anywhere. Soft tropical air, sunrise bird song, essences of ginger and plumeria, golden sunsets, sparkling waterfalls — you don’t just go to Kauai, you absorb it with every sense. It may get more than its fair share of tropical downpours, but that’s what makes it so lush and green — and creates an abundance of rainbows. Kauai is essentially a single large shield volcano that rises 3 miles above the sea floor. The island lies 90 miles across the open ocean from Oahu, but it seems at least a half century removed in time. It’s often called “the separate kingdom” because it stood alone and resisted King Kamehameha’s efforts to unite Hawaii. In the end, a royal kidnapping was required to take the Garden Isle: After King Kamehameha died, his son, Liholiho, ascended the throne. He gained control of Kauai by luring Kauai’s king, Kaumualii, aboard the royal yacht and sailing to Oahu; once there, Kaumualii was forced to marry Kaahumanu, Kamehameha’s widow, thereby uniting the islands. A law on Kauai states that no building may exceed the height of a coconut tree — between three and four stories. As a result, the island itself, not its palatial beach hotels, is the attention-grabber. There’s no real nightlife here, no opulent shopping malls. But there is the beauty of the verdant jungle, the endless succession of spectacular beaches, the grandeur of Waimea Canyon, and the drama of the Na Pali Coast. Even Princeville, an opulent marble-and-glass luxury hotel, does little more than frame the natural glory of Hanalei’s spectacular 4,000-foot-high Namolokama mountain range. This is the place for active visitors: There are watersports galore; miles of trails through rainforests and along ocean cliffs for hikers, bikers, and horseback riders; and golf options that range from championship links to funky local courses where chickens roam the greens and balls wind up embedded in coconut trees. But Kauai is also great for those who need to relax and heal jangled nerves. Here you’ll find miles of sandy beaches, perfect for just sitting and meditating. There are also quiet spots in the forest where you can listen to the rain dance on the leaves, as well as an endless supply of laid-back, lazy days that end with the sun sinking into the Pacific amid a blaze of glorious tropical color. Step off the plane and feel the warm embrace of Kauai with average yearly temperatures ranging between 84 and 69 degrees. Ocean temperatures are also perfect ranging from 71 to 81 degrees year round. Kauai offers seven distinct microclimates, from lush interior spots to arid areas on the West Side. Mount Waialeale (elevation 5,148 ft) is at the heart of Kauai’s uninhabited interior and is a quintessential rainforest with over 400-inches of rain per year. The rain that falls around Mt. Waialeale generally does not affect the coastal parts of the island, which get far less rain than the central spots (as little as 18-inches a year in western areas). Much of Kauai’s rainfall is a nightly occurrence, and the rain showers that do occur are almost always brief. When you do see rain, wait for the beautiful rainbows that follow. The trade winds in Kauai also keep things cool for visitors. The winds are generally light and help chase away much of Hawaii’s humidity. With such great weather, any time of year is a good time to visit Kauai. There are various accommodations to meet your needs. 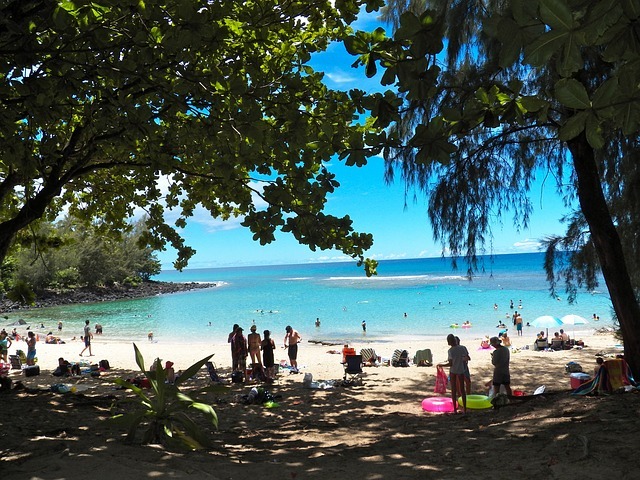 You’ll find everything from budget hotels to luxury resorts in the areas of North Shore (Princeville), East Side (Coconut Coast), Lihue (Kalapaki), South Shore (Poipu), West Side (Waimea). Kauai is also known for its charming bed and breakfasts and guest cottages. You can also rent a condominium or home, which is great for on-the-go families. If you’re planning to explore the island, it’s best to rent a car. 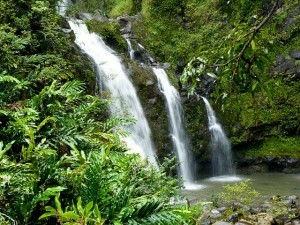 This will allow you the flexibility to tour Waimea Canyon one day then spend the next in Hanalei Town. Shuttles and tours are also available, though stops will be limited. With 143 miles of coastline, Kauai has more beaches per mile than any other Hawaiian island. Choose from over 40 sandy white beaches during your Kauai beach vacation and enjoy surfing, body boarding or windsurfing. Swim in aquamarine waters, scuba dive, snorkel or just lay back and enjoy the calm. Kauai offers many kinds of shopping throughout the island, from small shops to malls. Stores offer many unique items to take home and enjoy, beyond souvenirs: apparel including aloha shirts, jewelry, home and personal accessories, and art. On the North Shore, explore specialty shops that carry unique gifts and vintage used clothing. Perusing antiques from exotic lands such as Tibet and India, jewelry, Oriental rugs, pearl bracelets, and other fine gifts can be much fun. You can even find the only soap and candle factory in Hawaii. More interesting shops in Hanalei, Princeville, and throughout the North Shore are nothing short of a shopper’s paradise. On the East Side, Kapaa Town and Kinipopo Shopping Village offer a variety of fun shops and eateries. Aloha shirts, vintage maps, fine art, and jewelry are all available in the area. Wailua Shopping Plaza houses several restaurants and an eclectic antique shop. The Coconut Marketplace is home to more than 70 shops in which you’ll find precious Hawaiian mementos, fine artwork, antiques, jewelry, craft items, and so much more. Lihue and the Kalapaki area offer country stores, funky and fine art shops, nifty gift nooks, and farmers’ markets (onKauai, they’re called Sunshine Markets). Authentic Kauai crafts are a treat to shop for after a tour through the Kauai Museum — Niihau shell leis, woodwork, lauhala weavings, coconut products, and more. Beyond the Kauai Museum, you’ll find many more notable mementos to take home including soaps, paintings, clothing, coffee, Kukui guava jams, fabrics, and many other collectible items. The South Shore has the Poipu Shopping Village with a selection of shops, services, and eating establishments. The medley of gift choices here is incredible. Pillows, Hawaiian handmade paper, unique jewelry, children’s items, formal and fun apparel (including silk dresses), swimwear, candles, soaps, sterling silver items, and enough to keep you browsing for a day or more. The numerous surf shops offers surfwear, swimwear, and watersports equipment. Nearby Old Koloa Town is another stop worth making, with its funky island apparel, Kauai-artist-only crafts, coveted Niihau shell leis, a variety of dining and snacking establishments, local grocery store, candles, soaps, and more. Eleele Shopping Center on the West Side is where you’ll find a handful of stores, conveniences, and tour boat company offices; it’s a great place to mix with locals. Hanapepe is known for its artists and you’ll love browsing amongst the smattering of wooden furniture, handmade soaps, pillows, plates, and cups — all with tropical motifs; antique prints of Hawaii, limited-edition graphics, and several other Kauai specialty products. Taro chips in numerous flavors make great gifts to take home. Friday night is Art Night with its block party atmosphere, as art galleries open up for viewing and occasional demonstrations, live music, and light refreshments. Port Allen, where red dirt shirts originated, is also a fun stop for souvenirs, yummy chocolates, and boat tours.